Bucolic horse trails and meandering coastal roadways help create the unique, magical ambiance of Hope Ranch; where a lush natural landscape, breathtaking ocean vistas and access to the Ranch’s own private beach make this a most highly desired residential enclave. 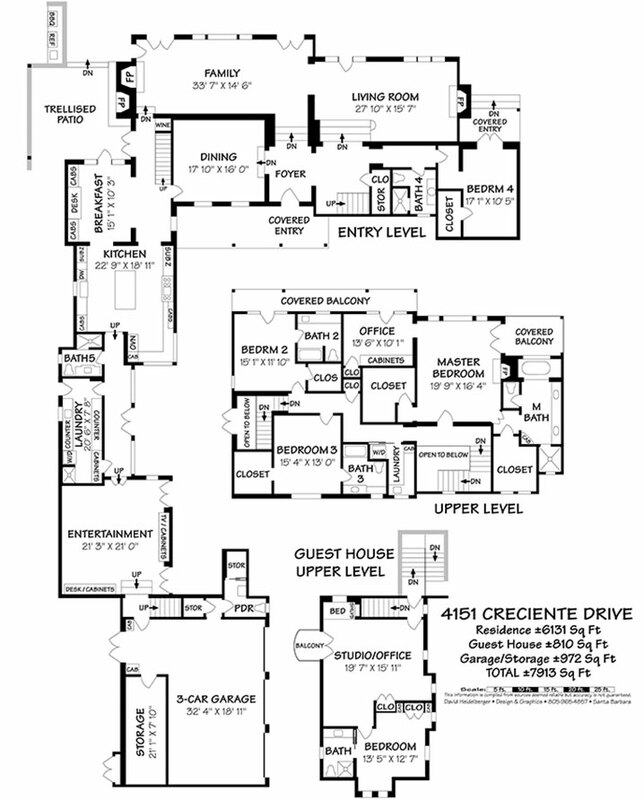 4151 Creciente Drive is a spectacular James A. Plunkett 1928 Italianate villa. Plunkett is well known as one of the foremost architects on the Santa Barbara coast during the golden years of the 1920s and 1930s, and his name adds an important historical and intrinsic cachet to a residential property. Rich in detail and charm, this home is a testament to Plunkett’s unparalleled talent and taste. Exceptional finishes include period-inspired decorative tiles, lustrous Venetian plaster walls, rich walnut plank flooring, and handsome wrought iron banisters and fixtures. This 4-bedroom, 5½-bath home of approximately 6,131 square feet sits on a sweeping 1.24-acre bluff front property that enjoys never ending views over the Pacific and beyond to the Channel Islands. The property recently underwent an extensive renovation and remodel, where no expense was spared to honor Plunkett’s legacy of magnificent architecture and elegance. From the motor court, one enters an enchanting entry garden – lawns and leafy trees immediately create a tranquil and calm ambiance. From the covered entry, one enters the foyer and is immediately drawn to panoramic ocean views through the south facing windows in the large and inviting Family room which overlooks a wonderful outdoor seating and dining area. Three steps down from the Foyer, a classic Plunkett design element, is the Formal Living Room. This grand and formal room opens into the adjacent Family Room, and when used together, these two rooms create a marvelous space that is perfect for large-scale entertaining. A lovely guest suite is located just steps from the Formal Living Room in its own private wing. The ocean view bedroom has a large bath and walk-in closet and enjoys its own covered entry. An intimate square shaped dining room featuring walnut wainscoting and parquet floors sets the tone for evenings of elegant dining. Beyond the dining room is an inviting family breakfast room/office with views across a trellised outdoor room to the ocean beyond. This patio is the perfect spot for casual meals and entertaining with its handsome stone fireplace and built-in BBQ. The exquisitely tiled gourmet chef’s kitchen is bathed in natural light from a skylight over the large central island. The kitchen features dual Wolf ranges, state of the art appliances and views to the shaded Entry garden. Continuing down the hallway from the kitchen is the Entertainment Room, replete with walnut paneled ceiling and cabinetry that create the perfect subdued atmosphere for the large screening room. A fully equipped Laundry and guest Powder Room complete this wing of the home. The upstairs level offers a luxurious Master Suite and two bedrooms each with full bath and walk-in closet. The Master Suite offers features plank and beam ceilings, a raised fireplace and private covered balcony that enjoys, yet again, beautiful ocean views. Large separate his and her walk-in closets complement the bedroom area. A cabinet lined Master bedroom office shares a covered balcony with the south facing guest room. The spa-like Master bath features a long vanity with double sinks, an inviting soaking tub with views to the ocean and a separate stall shower. One south facing bedroom looks out to the ocean from a covered balcony. The second bedroom overlooks the Entry garden. This floor also benefits from a small laundry room with washer/dryer unit and is accessed by both the Formal Entry staircase as well as a convenient Service staircase to the Breakfast room. What makes this home truly magnificent are its stunning gardens and outside areas. The inviting infinity pool extends from the Family and Living Room terraces out into the garden until it disappears into the blue horizon of the Pacific. Beautiful lawn terraced stairways descend to a sunken outdoor seating area on the bluff’s edge where the full beauty and grandeur of the property can be fully appreciated. A separate Jacuzzi spa is located steps from the pool. There is a charming 810 square foot guest house that sits above the three-car garage and is conveniently accessed either from the Media Room, or an exterior staircase. The suite is composed of a large Studio/Office with private balcony, and a separate bedroom with full bath. The three-car garage is equipped with interior storage and a small additional service bathroom, plus a large storage unit which can be accessed directly through the garage or from the exterior garden. 4151 Creciente harkens back to the golden days of Santa Barbara when elegance and refinement reigned supreme. That lifestyle can now be relived in this spectacular period home.